We are winning! And that’s not stopping any time soon. TIME magazine’s most recent cover got my attention. 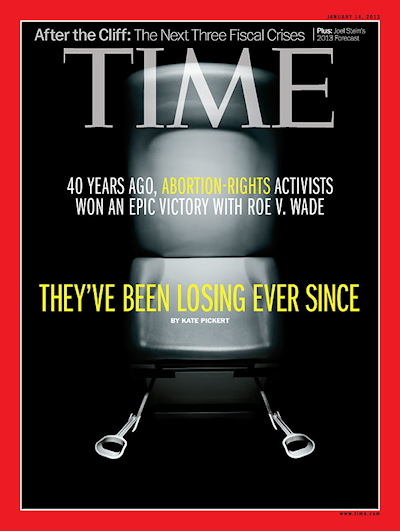 The Jan. 14, 2013 edition shows a hospital chair with stirrups, along with the capitalized words “40 years ago Abortion rights activists won an epic victory with Roe v Wade – They’ve been losing ever since” inscribed on the front. The title brought to a mind a moment when I felt that God had given me a message about the pro-life movement. The thought “You are on the winning team” came to me after a beautiful pro-life poster was taken off a building in New York. Although the removal of the billboard was discouraging, the thought that somehow we would still win gave me hope. While I suppose TIME’s title is meant to frustrate young anti-life activists into action, it should encourage pro-lifers to see that our labor is truly not in vain. We are making a tangible difference, even if we can’t always see it. The closing of an abortion clinic or an abortion doctor having a change of heart is an answer to prayer for faithful pro-lifers. Katie Pickert acknowledges that along with the closing of clinics, the number of abortion providers is decreasing. Pickert believes that a shifting in public opinion is connected to technology being easily accessible. She says, “In this age of prenatal ultrasounds and sophisticated neonatology, a sizable majority of Americans supports abortion restrictions like waiting periods and parental-consent laws. The anti-abortion cause has been aided by scientific advances that have complicated American attitudes about abortion. The prenatal ultrasound, which has allowed the general public to see fetuses inside the womb and understand that they have a human shape beginning around eight weeks into pregnancy, became widespread in the 1980s, and some babies born as early as 24 weeks can now survive. Arts and entertainment have also played a part in bringing a positive change in public opinion regarding abortion. The inspirational pro-life film October Baby is sold at Walmart, the movie Bella was a success, and even secular films like, Juno and Knocked Up display women choosing birth over abortion. I believe that the most important and unaccounted for reason the pro-life movement is winning is because of prayer. Movements like “40 Days for Life” have gathered thousands of people across the country to pray outside abortion clinics. “Bound4Life” is a pro-life ministry that has encouraged hundreds of thousands to wear red life bracelets and pray daily for the ending of abortion. These prayers are making more of a difference than we’ll ever know. The past few years have seen the emergence of young leaders like Kristan Hawkins of Students for Life of America, who is responsible for organizing more than 675 pro-life groups on college campuses across the nation, and Lila Rose of Live Action, whose undercover video work has forced the abortion industry to confront and amend practices it cannot defend, as well as dozens of other future leaders who have assisted our organization as staff members and interns. Leaders like Hawkins, Rose, and Buchanan are taking the pro-life movement in the right direction. As Emily says, “[o]ur fight transcends elections and legislative battles because our fight is in our hearts. This is why, 40 years after Roe, our movement is still growing. We won’t give up; we can’t give up. Our fight is for life. We will win this battle!